Revealing one of my more useful butchery diagrams --- a pork butchery chart, with labels and everything! 16 x 20 inches, natural vine charcoal on 100% cotton rag. This is part of a set of originals, commissioned by a customer for her foodie husband's birthday. She like the "negative space pig" from back in January, and commissioned me to make a cow and lamb butchery chart in the same style, but with the added labels for all the meat sections. Working on this larger scale was nice, as my work is typically less than 8 x 8 inches. I like the look of this guy too. I think he's kind of art deco-ish, style-wise. The customer came by with her husband and adorable daughter yesterday for the big reveal, so I can show the works off on the blog now. They seemed to like them, which is, of course, wonderful. 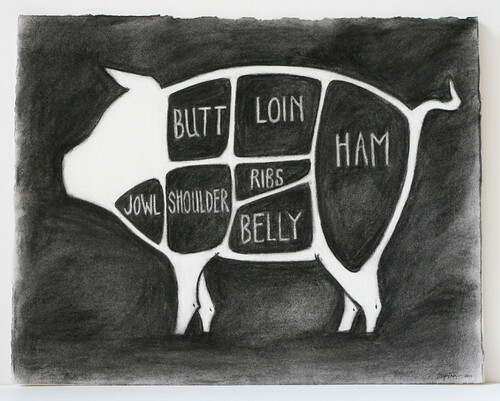 I have 8.5 x 11 prints available in my shop, right here: http://www.etsy.com/listing/62576215/charcoal-pig-butchery-diagram-print $18.